£20 Off First Orders Over £80 Plus Free Delivery at Waitrose & Partners Enjoy a discount on your first order and get it delivered for free! £20 Off Third Grocery Shop Order Over £80 Plus Free Delivery at Waitrose & Partners Let Waitrose reward you for being a regular shopper with £20 off your third grocery order. £20 Off Fourth Grocery Shop Orders Over £80 Plus Free Delivery at Waitrose & Partners Deduct a massive £20 off your shop at Waitrose with this code. 3 for £10 on Selected Meat and Fish at Waitrose & Partners Stock up on your meat and fish for the week with 3 for £10 at Waitrose & Partners. Discover 1/3 Off Selected Fizz and Wine at Waitrose & Partners Browse the selection of red, white and sparkling wines at Waitrose & Partners and find up to 1/3 off. Buy One Get One Half Price on Hot Cross Bun Orders at Waitrose & Partners With Easter just around the corner, this offer is the perfect way to stock up on delicious hot cross buns. Up to 1/3 Off Easter Roasts at Waitrose & Partners Make Easter more enjoyable, and save big on a delicious roast dinner at Waitrose & Partners. £20 Off Fifth Orders Over £80 Plus Free Delivery at Waitrose & Partners Enjoy £20 off your fifth order when you spend £80 with this code! Indian Meal Deal for 2 for £10 at Waitrose & Partners Treat yourself, and save a pretty penny with this tasty offer at Waitrose & Partners. Up to 40% Off Laundry Products at Waitrose & Partners Save big and stock up on laundry products at Waitrose & Partners. Waitrose & Partners has around 350 stores in Britain, including some new smaller convenience stores in urban areas, as well as their larger out of town and high street supermarkets. They have over 90,000 employees in the UK, both in their stores and in their head office in Bracknell in Berkshire. Waitrose offers its home delivery service on groceries to many postcodes around the UK, and is always working on expanding their delivery capabilities to reach even more customers. Whether you like to shop online or browse in their stores, you can make excellent savings by shopping smart with Waitrose discount codes and coupons from vouchercloud. Waitrose also have online stores for pet supplies, wine, kitchenware and more! Save time by ordering online and collecting at your nearest Waitrose. Their click and collect service is free on orders over £40, too, saving you money on delivery charges. Waitrose & Partners promise to pick out your produce with the same care as you would yourself. What are the delivery charges for shopping online at Waitrose & Partners? Delivery charges vary depending on the slot you choose and the value of your order, however, delivery on orders over £60 is free. Use the helpful branch locator here on the Waitrose & Partners website to find stores near you. Is Waitrose home delivery available everywhere in the UK? Waitrose home delivery for groceries is not available everywhere, though this is something the company is aiming towards. You can search before you place an order or register to make sure your postcode can get service. Orders from non-grocery Waitrose sites where normal mail services can be used, such as for kitchenware, can be delivered to addresses outside of the grocery delivery range. Standard Delivery is Free over £60 - but is unavailable otherwise. Waitrose delivery hasn't rolled out everywhere just yet, but you can check if your postcode is covered while shopping. You can also reach individual Waitrose branches and other contact options here. You can find individual opening times for your local Waitrose via the branch finder tool. 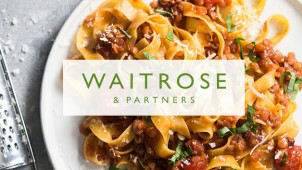 Waitrose & Partners is one of the UK's most popular supermarkets, and if you love their high-quality foods and household products, you'll be pleased to know that there are lots of ways to save both in-store and online when you use a Waitrose voucher. With lots of great own brand products, fresh produce, branded goods and even fine wines, you'll find everything you need for everyday life or for creating a special meal at Waitrose & Partners, and with convenient home delivery and click and collect options, you can now find what you are looking for without trawling the aisles! Waitrose & Partners is a business that has won lots of accolades, including Supermarket of the Year in 2016. It also has royal warrants from both the Queen, and the Prince of Wales. Waitrose is generally considered to be a higher end supermarket choice among the big name supermarkets in the UK, and while it does have some great budget-friendly ranges and offers, if you are looking for the highest in quality and some more luxurious or exotic products, Waitrose is a great place to shop. Waitrose & Partners is renowned for its wines, and when you shop online, you can find some great deals by the bottle or case, all of which are available for home delivery. Top up your cellar for a tantalisingly good price, when you shop online with a money-saving Waitrose discount code. If you need plenty of champagne for a special occasion, or want to stock up on your favourite vintage, Waitrose literally takes the heavy lifting out of getting your wine!